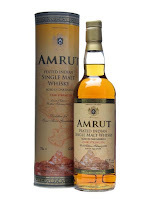 Today I’ve got an Amrut review. This was tasted at the Whisky Exchange Show London 2016. Amrut enjoys a bit of a reputation and after tasting Fusion back in May I saw why. It was lovely, so I was curious to try more and in the end I went for something I thought would be up my street: Amrut Peated Cask Strength. Nose: Really intense of course but not on the peaty side weirdly. Very spicy with lots of clove, liquorice and aniseed. Water: Much lighter with vanilla and caramel. Taste: Very boozy, alcohol, intense fruit, intense oak and a little smoke. Not really peaty as such, not in an Islay way anyway. Water: Much lighter again, some smoke, vanilla and toffee. Finish: Medium/Long length. Boozy, fruit and oak. This certainly was an interesting experience but was not was I was expecting. I was expecting a peat bomb but this didn’t seem very peaty at all. The oak is very loud and is lacking balance from that I think.